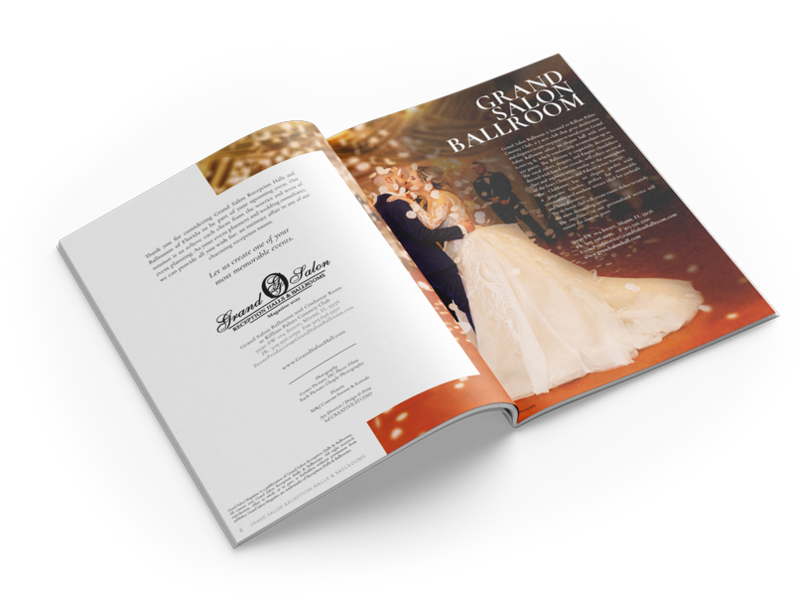 Grand Salon’s elegant Reception Hall location offers over 5,300 square feet. We’re the best Miami wedding venue and located in the heart of Kendall Miami Florida! This can comfortably accommodate a reception of up to 200 guests with plenty of space for dancing and mingling. The Welcome Cocktail area gives distinction to the event as well as a personalized service for the guests from the time of their arrival. Guests are assured of a great time catching up with one another before the main event, while enjoying cocktails. The reception hall would be exquisitely decorated throughout with flowers, colors and lights the day of the event. The royal colors, the drapery and the Empire Chandeliers, dressed with hand-cut crystals, will reflect an era of class and elegance that are sure to lend a special atmosphere as the finest Chateaux and Palaces across Europe. One of the most majestic reception halls in Miami, its design adds a touch of opulence to any occasion that never fails to impress. Grand Salon Reception Hall and Ballroom also provides an in-house chef which will honor his title as Maitre Rotisseur to create exotic dishes to satisfy the most demanding tastes. With many years of experience in the culinary arts, our Chef has dedicated himself in creating an array of eye catching presentations and dishes. The Entrance and Main Room of one of the most elegant banquet halls in Miami are exquisitely decorated and the magnificent chandeliers hanging from the high ceilings give the spacious feeling of a Grand Salon. The raised levels on the main floor confer distinction and good visibility for the guests. While dancing the night away on our state-of-the-art dance floor, guests will have the sensation of being in a paradise under the stars, and the luxurious dressing room will enchant the event’s host. The diversity of our menu will bring ultimate contentment to the guests, and the excellence of our personalized service will be able to satisfy the most demanding tastes. The Welcome Cocktail area gives distinction to the event as well as a personalized service for the guests from the time of their arrival. Guests are assured of a great time catching up with one another before the main event, while enjoying cocktails. The reception hall would be exquisitely decorated throughout with flowers, colors and lights the day of the event. The royal colors, the drapery and the Empire Chandeliers, dressed with hand-cut crystals, will reflect an era of class and elegance that are sure to lend a special atmosphere as the finest Chateaux and Palaces across Europe. One of the most majestic reception halls Miami, its design adds a touch of opulence to any occasion that never fails to impress. This special day should be celebrated with friends and family and remembered for many years to come. For this reason, Grand Salon Reception Hall has created a reception package for those that wish for a beautiful and breathtaking wedding with out the high price tag. Grand Salon Reception Hall would like to present to you our NEW Mini Reception Package. This Mini Reception Package offers an elegant outdoor Gazebo Wedding Ceremony & Mini Reception Party for as little as $1,500! This Mini Reception Package includes a beautiful garden space which comfortably accommodates over 200 guests. Grand Salon Reception Hall and Ballroom offers an elegant banquet hall with over 6,000 square feet. This can comfortably accommodate a reception of up to 350 guests with plenty of space for dancing and mingling. The ballroom would be exquisitely decorated throughout with flowers, colors and lights the day of the event. The royal colors, the drapery and the Empire Chandeliers, dressed with hand-cut crystals, will reflect an era of class and elegance that are sure to lend a special atmosphere as the finest Chateaux and Palaces across Europe. The Miami Ciudamar room is located at Killian Palms Country Club, a 7-acre private club that gives distinction and elegance to any event. The Country Club House is accented by a stunning garden where a sumptuous Fountain stands, welcoming your guests to this luxurious mansion the day of your special event. The covered driveway will lead your guests to the Club House main entrance. Once inside, the elegant foyer with marble floors and Royal Chandeliers will give sparkle to the brilliant evening making the ultimate statement of sophistication.